I used to make terrines regularly but somehow making one went off my radar until just before Christmas. Now I’m back on them. 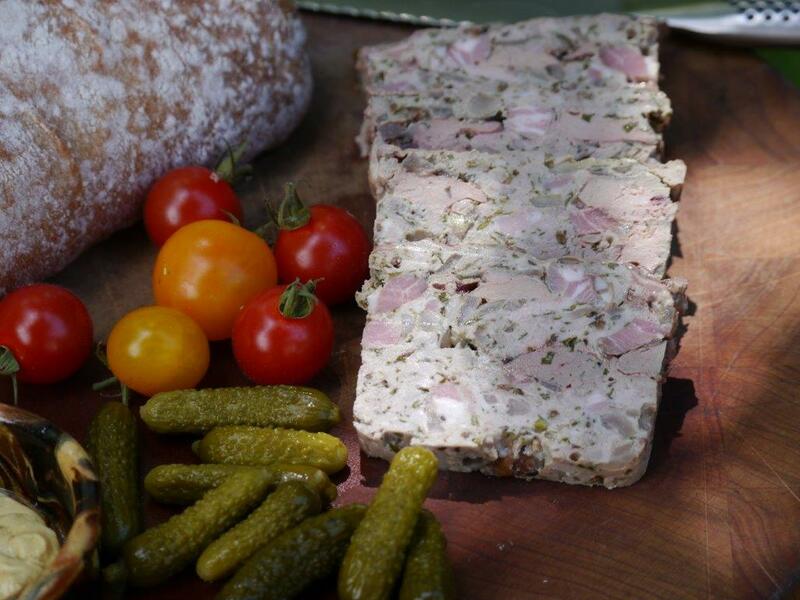 A terrine is so easy, particularly the following recipe. I made this with pork mince, turkey mince, speck and chicken livers but you could use any mix minced and cubed cured meats as long the total weight is about 1kg. Serve this as an entrée with plenty of bread, mustard and cornichons or a light meal with the addition of a salad. In a large bowl mix together all the ingredients except the livers. This is best done with your hands. Cut the livers into strips if the pieces are large. Grease a terrine dish or loaf tin with olive oil or duck fat. Put about a third of the mixture into the terrine pressing it down to get out any air bubbles. Lay half the chicken livers on top. Add another third of the mixture, the rest of the livers and top with the rest of the mix. Preheat your oven to 170°C. Place the terrine into a bain marie (the water needs to be hot) and into the oven. Cook for 60 minutes and then check to see if it’s cooked. Sometimes I find it needs longer so at this stage I remove the lid from the terrine dish and cook for another 15 minutes. When ready remove from the oven and from the bain marie. Let the terrine cool (don’t pour off the juices). Cover and refrigerate. It’ll keep in the fridge for a week and also freezes well. When you’re ready to serve it, if the terrine is stuck in the dish sit the dish in a little hot water for a couple of minutes and run a knife around the edges.